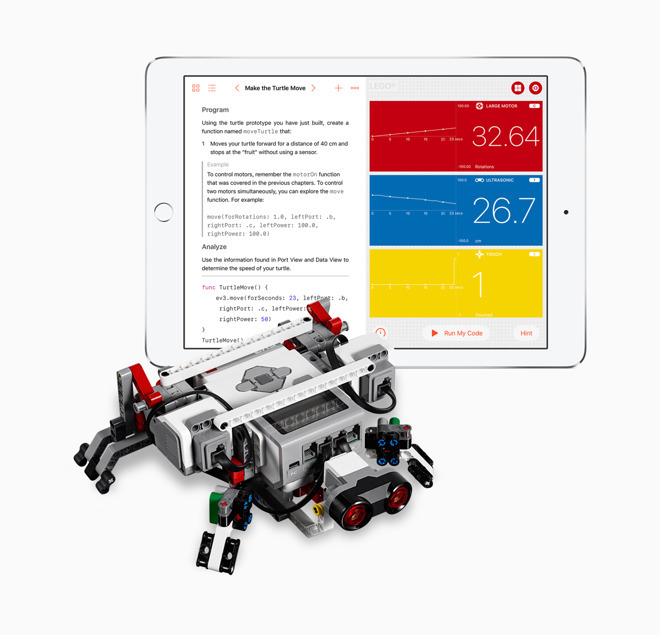 Apple on Thursday revealed that with a version 1.5 update on June 5 —the beginning of WWDC 2017 —Swift Playgrounds will include new material teaching people how to write programming for drones, robots, and similar electronics. The company is working with several electronics makers to incorporate the content, namely Lego, Parrot, Sphero, Ubtech, Wonder Workshop, and Skoog. In-app projects will, for example, guide users through using Sphero's Sprk+ robot in a real-world version of "Pong." The iPad app will also serve as a blank slate for more advanced coders, letting people build custom controls. People flying a Parrot drone will be able to specify yaw, pitch, and roll changes. Swift Playgrounds has long been able to communicate with external hardware through Bluetooth, and some parties like Wonder Workshop have already been taking advantage of this. The 1.5 update should, however, make the feature more prominent. Swift is an open-source programming language that works across Apple platforms. The company has been eager to foster adoption by both developers and students —on May 24, it introduced a free year-long course available through the iBooks Store, which will even be taught at some U.S. colleges and high schools starting this fall. Apple is likely unveiling the Playgrounds update now to clear the table for WWDC. The company is expected to make its first hardware announcements there since 2013, including new iPads, refreshed MacBooks, and possibly a rumored Siri home speaker.